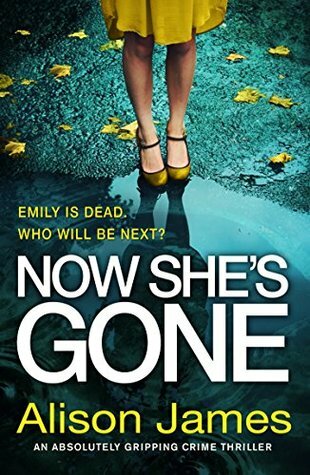 Now She’s Gone by Alison James is the second book in the Detective Rachel Prince police procedural series. What I’ve come to expect from this author is a very intense case and this installment was no exception with murder and molestation involved. With the death of a sixteen year old Rachel gets the call to head out and look further into the case to make sure it is being handled correctly. As Rachel digs further she starts to believe Emily’s death may be connected to another in the past and the clues begin to lead to even darker events than she ever could have imagined. With this book it was easy to remember exactly why I enjoyed the first when it didn’t take long at all to become comfortable with Rachel yet again. If looking for hard hitting female lead in this type of story Rachel certainly qualifies and the cases in the series are those to make a reader take notice and really become invested in the outcome. On the not so positive side though with this one there are some things going on in the story in which had my thought process going to the place where I think things end up a little to convenient with some details. I don’t want to be too specific but certain things just didn’t see that realistic to me in the story leaving me to rate this installment at 3.5 stars but with intense cases and a likable detective I will be back for more. The last few books I have read I have that things seem a bit too convenient. I don’t like that either. I really love the way you set up your reviews! Thanks Theresa! I’m right there with you on that when I find it in different genres. Other than the little conveniences, this sounds like it was enjoyable enough 🙂 Great review! Great review, Carrie. I have just finished reading this one. I also liked Rachel and I loved the developments in her personal life(some of them). Great review Carrie. Liking the main character is a great start to a book. I really love the cover on this one. I have not read either of these, I might have to check them out. A few of the books I have read lately tend to conveniently tie up loose ends, but if the main plot is good, I guess I sometimes over look that. Hope the next one is better for you. I liked the first a bit better but both cases are interesting, more than just another murder case anyway. But yes, the end was something along those lines of everything just sort of happens trying it all together.